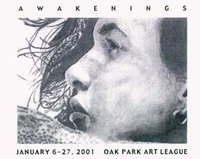 The Awakenings Project can provide small, short-term exhibits at conferences or special events, or much larger gallery showings that run for a month or more, some with 50+ artists, and up to 250 pieces of artwork. Travel can be arranged, however, most of our exhibits have been in Illinois, with the exceptions of South Bend and Indianapolis, Indiana, Dubuque, Iowa, Columbus, Ohio, St. Paul, Minnesota, and one in Washington D.C. Some of our artists have artwork in the permanent collection of the Recovery Gallery in Birmingham, Alabama. Kurt Taecker has a piece called "Celebration" in AstraZeneca Headquarters, and Ben Beyerlein has one called "Native Spirit," pictured at left on the postcard -- the original is at Eli Lilly's Headquarters. We have also done presentations at conferences, both individual speakers and panel discussions. If you think an Awakenings exhibit would serve you well in your venue, please contact us, and we will make every effort to work out the details with you. SEPTEMBER 5 - SEPTEMBER 30, Burning Bush Art Gallery once again invited us to exhbit there with an Opening Reception on September 9th. It's such a great space, with lots of activities taking place, both there and at Euclid Ave. Hope you made it to some of them! JULY 5 - 8 & JULY 12 - 15. Katrina Syrris invited Awakenings artists to exhibit artworks at the play, "Goodly Creatures, A Review of Shakespeare's Sonnets for Modern Times." The venue for the play was the Elgin Art Showcase, on the 8th floor of the Professional Building, where our studio is on the 4th floor. It's 164 Division St., Elgin, IL 60120. APRIL 8 - JUNE 24, The Awakenings Project held an exhibit at St. Mark's Church in Glen Ellyn. We met and spoke with people, and the artists gave a talk. The show was titled, "Awakening the Spirit Within. "There was also a reading of "Dementia Praecox" by a talented group of actors on May 3rd. "Dementia Praecox" is by playwright and Awakenings Co-Founder, Robert Lundin. JANUARY 13, In honor of Martin Luther King Weekend of Service, Awakenings offered a program at our Studio from noon until 2 PM to Awaken the Creativity in Everyone. It was free and open to the public. We had room for 18 artists to work, on a rotating basis. Everyone was welcome. OCTOBER 15 - NOVEMBER 30, We had another pop-up show at Art Area Studio 51 in Elgin, loosely based around a Halloween/Day of the Dead theme. We hope you were there for the scare! SEPTEMBER 10 - OCTOBER 8, We were back at the Burning Bush Art Gallery in Wheaton. Opening Reception was Sunday September 10th. Thanks again to Tony Asta and Bill Austin. They also hosted an Open Mic on Saturday evening, September 16th 7:30 - 9:30 PM and Irene led a Mandala Workshop on Sunday, September 17th in Wheaton and October 1st in Oak Park. We also had a FUNdraiser at Chipotle in Wheaton on the 17th. AUGUST 26-27, Thanks to the Glen Ellyn Lion's Club, we were once again invited to exhibit at the Glen Ellyn Festival of the Arts this year. Thanks Lion's Club organizers! JUNE 3-4, Thanks to Mary Coughlin-Lancaste for once again treating Awakenings to our very own booth at Kishwaukee Valley Art League show in Sycamore, IL. We had so much fun at this outdoor art fair, met some old friends and made some new ones. We even sold some art! Thanks Mary Coughlin-Lancaste! FEBRUARY 6 - NOVEMBER 4, Awakenings Fine Art had an ongoing exhibit for eight months at the Aurora City Hall. Rena Church invited us to show our work for our first time at Aurora City Hall. Five floors, filled with fantastic artwork (over 60 pieces) by Awakenings artists. Read more about it in Kane County Connects' article. Or more recently in the Illinois State Bar Association's Mental Health Matters newsletter. OCTOBER 2-23, 2016, Burning Bush Art Gallery in Wheaton, a ministry of the Gary United Methodist Church, invited us back again this year for our sixth show in their beautiful gallery. Thanks Tony Asta and Bill Austin! You two are the greatest gallery directors we know. The Opening Reception took place on Sunday, October 2nd. There was an open mic night on Saturday, October 15th. Also, there was a Mandala Making Workshop, led by Irene on Sunday, October 23rd. Be there or be square (Mandalas are based on the circle). JULY 15 - OCTOBER 10, 2016, We had an exhibit at the fabulous Elgin Artspace Lofts interior gallery space, courtesy of resident artist Peter Austin. Then some of those pieces were moved for the month of September into Art Area Studio 51 gallery on the southwest corner of the Elgin Artspace Lofts building in Elgin. They were up until October 10th. JUNE 4 & 5 2016, Kishwaukee Valley Art League show in Sycamore, IL. We had so much fun at this outdoor art fair, met some old friends and made some new ones. We even sold some art! Thanks Mary Coughlin-Lancaste! OCTOBER - NOVEMBER, The Healing Gallery at Presence St. Joseph Hospital in Elgin - We were so excited to have been invited to return to The Healing Gallery at Presence St. Joseph Hospital by its curator, Lillian Pagni. It still is a beautiful, intimate, healing space, and we had lots of visitors who learned more about The Awakenings Project, and our studio in nearby downtown Elgin. OCTOBER 4 - OCTOBER 25, Burning Bush Gallery, Wheaton, IL Thanks again to Bill Austin, Tony Asta, and the Gary United Methodist Church for inviting Awakenings Back for our fifth exhibition there. We had an opening reception on Sunday, October 4th, and it was fabulous as usual. On the 25th, Irene led a group of a dozen people in a Mandala Making Workshop, and also helped us raise funds for Awakenings Fine Arts. APRIL 1 - JUNE 30, The Theosophical Society in Wheaton - Thanks to Paula Finnegan of The Theosophical Society, Awakenings artwork was exhibited for three whole months during their Spring exhibition period. It was an awesome space to be in. There was an Opening Reception on April 11th, where lots of old friends from many walks of life reunited. It was magical. OCTOBER 5 - OCTOBER 26, Burning Bush Gallery, Wheaton, IL - Thanks once again to Tony Asta and Bill Austin for inviting us to return to their newly renovated and beautiful gallery space. Our opening reception wason October 5th, and we also hosted a poetry and music night, with a special reading of "Stories" by playwright and Awakenings founder Robert Lundin on October 25th. We dedicated the Burning Bush Art Gallery show to celebrate the life of and hold the memory dear of Bridget Coughlin, Awakenings artist, forever. AUGUST 23rd and 24th, Glen Ellyn Festival of the Arts - The 45th Annual Festival of the Arts featured Awakenings along with many other non-profit organizations and over 80 other locally and nationally known artists. JULY 31 - August 30, 2014, Elgin Art Lofts Gallery, Elgin, IL - Peter Hallock Austin, Elgin Art Lofts resident, invited Awakenings artists to join him in his exhibit at the Elgin Art Lofts Gallery. It is a great big, beautiful space, and we helped him fill it with fabulous artwork. Opening reception was on Saturday, August 2nd. JULY 12, 2014, Summer Jam Westgate Music & Arts Festival - We were invited, and went to the Summer Jam Westgate Music & Arts Festival in Columbus, Ohio. It was an exciting road trip and we met some wonderful people there. APRIL 25 - JUNE 22, Exhibit at North Central College - For the first time ever, we were asked to exhibit at (Irene's alma mater) North Central College's Schoenherr Art Gallery in the Wentz Concert Hall. Sponsored by the Arient family, it was a spectacular exhibition! Reception was Friday, May 2nd from 6 - 8 PM. FEBRUARY 19 - 23, Pop-up exhibit at SideStreet Studio Arts, Elgin, IL - We put up a short-term (pop-up) exhibit at the fabulous Side Street Studios in Elgin. Reception was Saturday, February 22nd, from 7 - 10 PM. A short show, but one not to be missed! We debuted our new CD of Poetry and Music there. It was great! OCTOBER 18th, at NAMI-IL Conference in Itasca, IL - Irene gave a presentation of a Recovery Activity - Attendees were invited to express their message of recovery on a 12" square of fabric, either by writing, drawing, painting, or a combination. This activity provided people from all over Illinois with the impetus to create their very own recovery quilts for their affiliates. OCTOBER 13 - October 31, NAMI-Dubuque, IA (see page 3) - We partnered with NAMI-Dubuque in conjunction with the play, "Next to Normal." We had a fantastic art exhbition at Quigley Gallery. Opening Reception was on October 13th at the Quigley Gallery of Clarke University in Dubuque. Then on November 17th, some Awakenings art was also shown at the Grand Opening of the new offices of NAMI-Dubuque. OCTOBER 10-11, Macalester College, St. Paul, MN - Awakenings was invited to exhibit work at Macalester College's 20th Annual International Roundtable. We set up a display in Markim Hall and interacted with students, faculty and community members about mental health. Sean T. Lamb and Irene Lamb O'Neill were there on Oct. 10th and 11th, answering questions. SEPTEMBER 8 - October 6, Burning Bush Gallery, Wheaton IL - We exhibited at the fabulous Burning Bush Gallery, next door to (and part of) the Gary United Methodist Church. This was our third time helping them raise awareness of the creative talents of those of us with mental illnesses. Our opening reception was on September 8th, poetry /music and a reading of Dementia Praecox, a play by Robert Lundin, took place on September 27th, and we had a Closing Reception on October 6th. AUGUST 24th, Glen Ellyn Festival of the Arts - The 44th Annual Festival of the Arts featured Awakenings along with many other non-profit organizations and over 50 other artists. FEBRUARY 25th, Aurora University - We participated in a Community Mental Health Resource Fair at A.U. That evening, Aurora University Arts and Ideas hosted Kay Redfield Jamison. The event was part of the Arts and Ideas Series. FEBRUARY 8th, U of I, Champaign-Urbana For the 3rd year in a row, we were invited to be the Illinois Charity Organization to benefit from a combined performance of three theater groups: New Revels, What You Will, and Penny Dreadful Players. They also put on "The Game," a short play by Robert Lundin, this year. OCTOBER 20th, The Awakenings Project celebrated 15 years of empowering artists in a big way. 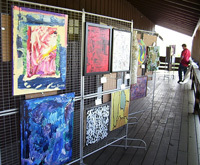 All the arts were celebrated at our gala at the Lake Ellyn Boathouse. There was poetry and two theatrical readings of Robert Lundin's short plays, music, awards, scholarships, lots of artwork, door prizes and more. SEPTEMBER 23 - October 10, The Awakenings Project returned to the Burning Bush Gallery in Wheaton for an encore show featuring all new work. There was an opening reception on Sunday, September 30th, and a poetry/music night on Friday, October 5th. SEPTEMBER 17-21,Northern Illinois University Student Center,The Awakenings Project had a week-long art exhibit at Northern Illinois University, culminating with a Poetry/Music Night as part of NIU's "Say It Out Loud" Campaign. This event was also part of the larger Mental Health Illinois "Say It Out Loud" Campaign, and was included in the national SAMHSA Wellness Week Campaign. FEBRUARY 2012, Gallery 200, West Chicago, IL - Awakenings returned to Gallery 200 with an art exhibit upstairs, poetry and music downstairs. Opening reception was February 3rd. Poetry readings and music downstairs at 203 Turner Court on February 17th. DECEMBER 3, Awakenings Studio, Elgin - We experienced a fun hour of "Laughter Yoga" led by Len Lempa! NOVEMBER 19, Awakenings Studio, Elgin - We had our 3rd fabulous reception to honor the winners and all contestants in the PhotoVoice contest, held in conjunction with Recovery Connections of Advocate Good Samaritan Hospital. OCTOBER, 2011, Illinois Valley Community College, Oglesby, IL - Opening Reception was September 30th, exhibition ran concurrently in ARTworks phantom gallery in downtown LaSalle. Joel and Lori Munson led a panel discussion on October 12th that went excellently well! SEPTEMBER 23rd, The Gail Borden Library in Elgin - Joel Munson and Mike Rudis helped Pat Lindquist organize a display of artwork by artists with psychiatric disorders, including some Awakenings artists. They also created a piece of art to be displayed in the region 2 office. AUGUST 27 - SEPTEMBER 16, Illinois Institute of Technology, Chicago, IL - with opening reception on Saturday, August 27th. Hosted by IIT's chapter of Active Minds, and billed as a way to change the conversation about mental health and as an awareness/outreach event. It was an impressive exhibit of Awakenings artwork, and The Awakenings Review was showcased. JULY 6th - 8th, NAMI National Convention, Chicago Hilton - We triumphantly returned to the NAMI National Convention for the first time since it was in Chicago, in 1999, which was covered by JAMA! This time, in addition to a huge art exhibition, we also hosted a National Poetry Slam, which was not to be missed. MAY 19th, Bundles of Books and Gifts, Glen Ellyn - Poetry readings, music, open mic, organized by Joel Munson. Poets and musicians performed at Bundles of Books & Gifts. Awakenings fans, supporters, and bookstore regulars showed up. FEBRUARY 11th, 8 PM, University Place Christian Church, Champaign, IL - "In Between Dreams," a collaboration by three theater groups, "Penny Dreadful," "What You Will" and "New Revels." This was a great fundraiser, with all profits going to The Awakenings Project. JANUARY 30, Barrington United Methodist Church, Barrington, IL - Invited by Karen Maxwell, Music Director, to exhibit at their 5th Sunday Fine Arts Festival. Art show and reception 6:00 - 8:00 PM, with a Concert from 7:00 - 8:00 PM. The music was even better than the food! NOVEMBER 13th, Awakenings Studio, Elgin - Fabulous reception to honor the winners and all contestants in the PhotoVoice contest, held in conjunction with Recovery Connections of Advocate Good Samaritan Hospital. NOVEMBER 9th, Interfaith Mental Health Conference - Awakenings had an exhibit at "The Mental Health Needs of Your Faith Community: How to Recognize, Respond and Refer," which targeted an audience of people with interest in mental health. AUGUST 2- OCTOBER 29, Provena St. Joseph's in Elgin - Several Awakenings artists exhibited in Provena St. Joe's beautiful "Healing Gallery. "The opening reception was on August 20th, and it was great. SEPTEMBER 26 - OCTOBER 24, Gary Methodist Church in Wheaton - Burning Bush Gallery hosts an art show with a different theme each month. During "Mental Illness Awareness Week," The Awakenings Project had 44 works of art on exhibit, with some never before seen artists. Opening Reception was Sunday, October 3. OCTOBER 14th, Denny's Restaurant, Fox Valley - A fundraising effort for Awakenings, led by Joel Munson with Awakenings poets, artists, musicians, and supporters. Awakenings fans, family, friends, and Denny's regulars came out. 10% of all meals purchased between 4 PM and 8 PM was donated to The Awakenings Project. Great food, great fun, excellent company. Thank you Denny's. OCTOBER 9th, Advocate Good Samaritan Hospital - Awakenings hosted an art-making drop-in group from 10 AM - 3 PM at the FAMILIES (Families And Mental Illness Learning and Inspiring through Education and Support) Symposium. OCTOBER 7th, Bundles of Books and Gifts, Glen Ellyn - Poetry readings, music, open mic, organized by Joel Munson. Poets and musicians performed at Bundles of Books & Gifts. Awakenings fans, supporters, and bookstore regulars showed up. AUGUST 23 - 25, Westin-Yorktown Lombard - The National Association of Peer Specialists invited The Awakenings Project to exhibit at their annual conference in Lombard, Illinois. We had the opportunity to introduce Awakenings to Peers and Peer Specialists from all over the country, with great success. JULY 31st, Lake Ellyn Boathouse, Glen Ellyn, IL - Awakenings hosted our biggest bash yet - a grand soiree, celebrating the 10th year of publication of The Awakenings Review! This was one party not to be missed. There was a silent auction of Awakenings artwork, a Poetry slam, live music, and Dancing! JUNE 2nd, Region 1 Consumer Conference - With the name, "The Art of Recovery," it was the perfect place for an Awakenings exhibit and an opportunity for us to hold an artmaking session for conference attendees. Organized by a team of recovering individuals, led by board member and Recovery Specialist for DMH-Region 1 at Chicago Read Mental Health Center, Virginia Goldrick, Ph.D.
MAY 5th, Community Resource Center of Hanover Township Mental Health Board, Streamwood - Hanover Township Mental Health Board hosted a talk for Mental Health Recovery Month, and invited The Awakenings Project members to give a presentation to Streamood and Hanover Park Chambers of Commerce. Artwork was on exhibit the entire month of May. APRIL 30 - MAY 2, DBSA National Conference, Itasca IL - The Awakenings Project exhibited and sold artwork and journals, raising awareness of the talents of people with mental illnesses, and celebrating DBSA's 25th anniversary at their annual National Conference at Eaglewood Resort and Spa in Itasca. We also led a relaxation session on Sunday, May 2nd, "Your Inner Artist: Awaken the artist in You," with watercolors, colorful collages, jewelry making, & more. APRIL 23rd, Elgin Mental Health Center - We exhibited alongside Erasing the Distance at the inpatient Recovery Conference, works of art by Awakenings artists as well as inpatients who created them during 3 workshops led by Awakenings artists on February 20th, March 6th and 27th. APRIL 1st, Bundles of Books & Gifts, Glen Ellyn, IL - Poets and musicians performed at Bundles of Books & Gifts, led by Joel Munson, including Awakenings poets, other local poets, and some musicians. Awakenings fans, supporters, and bookstore regulars attended. JANUARY 29th, Denny's Restaurant, Fox Valley - A fundraising effort for Awakenings, led by Joel Munson with Awakenings poets, artists, musicians, and supporters. Awakenings fans, family, friends, and Denny's regulars came out. 10% of the price of all meals purchased between 4 PM and 10 PM was donated to The Awakenings Project. Great food, great fun, excellent company. Thank you Denny's. DECEMBER 12, 2009, The Awakenings Studio - The Awakenings Project participated with the Downtown Neighborhood Association of Elgin in their Window Wonderland Event. We made lots of ornaments for kids to paint. NOVEMBER 14, 2009, The Gail Borden Library - Ecker Center's Festival of Trees. We were delighted to have been invited this year to decorate a tree. It was called Awakenings' "Artistree" and it sold at auction. NOVEMBER 7, 2009, Awakenings Studio, Elgin - Fabulous reception to honor the winners and all contestants in the PhotoVoice contest, held in conjunction with Advocate Good Samaritan Hospital. OCTOBER 16-17,2009, Itasca Westin Hotel - During the NAMI-IL Conference, Awakenings held a statewide art show with work by artists from Antioch to Zeigler and all points in between. We also presented at a break-out group on Saturday October 17th. OCTOBER 8, 2009, Gail Borden Library - As part of National Depression Screening, and in conjunction with Provena St. Joseph's, Awakenings artists Joel Munson and Irene O'Neill told their recovery stories, focused on the use of non-traditional methods, along with several other professionals on a panel discussion. SEPTEMBER 1-27,2009, Awakenings exhibited in the elegant gallery of the Oak Park Public Library during September, showing a wide variety of artists' work, with emphasis on one of our founders, William Alexander, long-time Oak Park resident. There was a fabulous reception on Saturday, September 26th, with great music and poetry. SEPTEMBER 12-13, 2009, Indianapolis, Indiana - We were invited to have an exhibit at the national DBSA Conference. It was great. We met lots of supportive people from around the country. Next up, they want to do a podcast with Awakenings artists. AUGUST 14, 2009, 6 - 8 PM, Bundles of Books & Gifts, Glen Ellyn, IL - A group of poets and musicians performed at Bundles of Books & Gifts, led by Joel and Lori Munson, including Awakenings poets, other local poets, and three musicians. The event was attended by an incredible combination of Awakenings fans, supporters, and bookstore regulars. AUGUST 1-2, 2009, 11 AM - 5 PM, Art and Soul, Elgin, IL - Awakenings had an information only booth at Art & Soul. We met a lot of people who learned more about what we do and who we are. We had a great raffle with lots of happy winners. JULY 25 & 26,Indie Market, Chicago Several Awakenings artists have participated in the indie designer market, a high energy, colorful environment where you can buy directly from the designers themselves! With participation and assistance from the School of the Art Institute in creating this showcase and selecting artists, the Indie Designer Market presents an exclusive exhibition featuring some of the most original and provocative talent Chicago has to offer. JULY 19, 2009 , The Josselyn Center CLR Drop-In-Center - A group of Awakenings artists visited the CLR Drop-In_Center bringing art materials and led workshops in jewelry making, poetry and music. JULY 10, 2009, 4 - 6 PM, Elgin Mental Health Center - A group of Awakenings artists collaborated with Elgin Mental Health Center, exhibited and sold artwork, read poetry and played music in the Frederick Wines Auditorium, Rehabilitation Building on the Elgin Mental Health Center Campus. JUNE 27 & 28,Indie Market, Chicago See indie market above. JUNE 27, 2009, Awakenings Studio. Awakenings hosted another National Day of Service for Mental Health - Awakenings Style (National Health Care Day of Service), free and open to the public. It was great. You can see the collage we created by clicking here. MAY 17 - JUNE 20, 2009, Steppenwolf Merle Reskin Garage Theater, Chicago. At the invitation of Tara Mallen, the women of Awakenings had artwork on display through the end of the play, "The Walls," about women and madness and the link to creative genius. 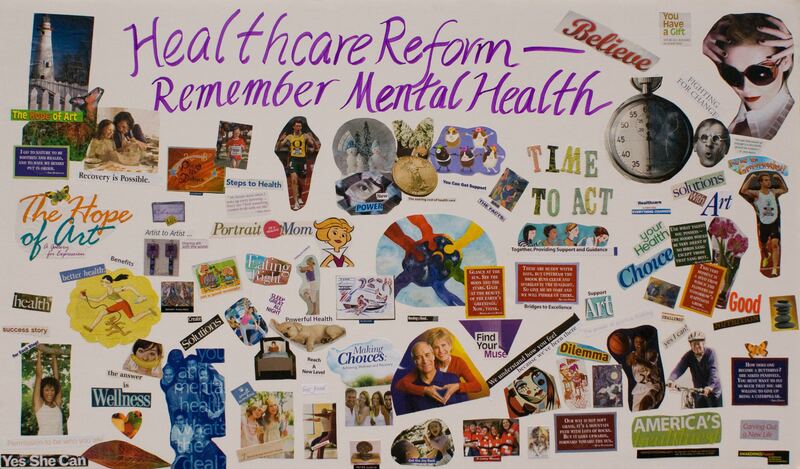 MAY 2-31, 2009, Community Resource Center of Hanover Township Mental Health Board, Streamwood. The Hanover Township Mental Health Board hosted a month-long exhibit, with a networking event at the Community Resource Center on Monday Evening, May 4th. MAY 14,2009, Flourish Studios, Chicago We had an exhibit with "Erasing the Distance" (the company formerly known as "Cheryl's Dreaming Big") as they introduced people to their new theatrical productions for 2009 that shed light on mental illness in their Spring Showcase. Awakenings had art on exhibit, and our internationally acclaimed Awakenings Review journals on sale. APRIL 1-30,2009. We had an exhibition at The Gail Borden Library in Elgin, in the "Movies, Music and More" section, from April 1st through April 30. APRIL 24,2009, 6 - 8 PM, Gallery 200, West Chicago We had a Poetry Reading during National Poetry Month at Gallery 200, led by variety of Awakenings poets in addition to other local poets and writers, in honor of this month and to celebrate the recent release of the latest Awakenings Review Journal. Music was provided by Mark Hull, guitarist extraordinaire. As part of the Recovery Conference, a panel of Awakenings artists discussed Creativity and Recovery and answered questions from the audience. NAMI-DuPage presented Pamela Spiro Wagner and Carolyn S. Spiro, M.D., authors of Divided Minds. Awakenings sold artwork and books, and met the authors! Cheryl's Dreaming Big performed Erasing the Distance. Awakenings exhibited alongside them. Art exhibit at Celebration Recovery, presented by The Irwin Foundation and co-hosted by Thresholds and DBSA. The Awakenings Project's opening reception at its new studio. The reception drew a large crowd. Artwork and copies of The Awakenings Review were available for purchase. Several Awakenings artists painted "rain barrels" for auction. NOVEMBER 30, 2007 -- Poetry Readings led by award-winning poet Laura Pickard and Music provided by Mark Hull and Mandy Rakow at Gallery 200 in West Chicago. Artwork by John & Mandy Rakow and John's parents. Poetry readings led by award-winning poet Laura Pickard and music provided by Mark Hull and Mandy Rakow. Artwork by various Awakenings artists. September 10, 2006 -- Celebration Recovery - Chicago Area's second major event celebrating the recovery of persons with psychiatric illnesses was at Arabian Knights' Farm. Awakenings art exhibit. Awakenings was awarded "Outstanding Contribution to Recovery by a Not-For-Profit Organization." Thanks to all who nominated us! June 1, 2006 -- Another Awakenings silent auction and great open house was held at Equip for Equality Headquarters 20 N. Michigan Avenue, Suite 300, Chicago, IL 60602. For more info, call EFE, (312) 341-0022. April 30, 2006 -- Hosted a panel discussion of Awakenings Artists at the Aurora Public Art Commission, as part of Bodies of Work: The Chicago Festival of Disability Arts and Culture. "The Untrained Eye and the Visionary Spirit - An Exhibit of Folk and Intuitive Art"
July 1999 (Chicago, Illinois) – Week-long exhibit at NAMI-National Convention, Chicago Hilton and Towers.